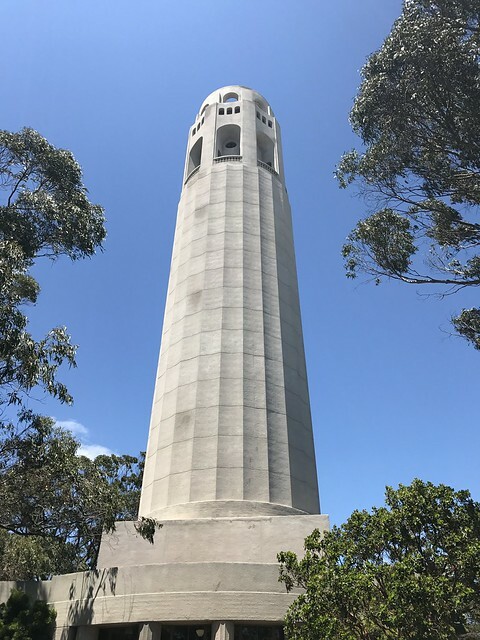 Despite living in San Francisco for (checks watch) almost 14 years now — and the Bay Area my entire life — somehow I’d never bothered to take the elevator to the top of Coit Tower… until yesterday. 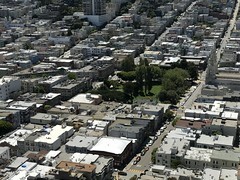 Don’t get me wrong, I’ve climbed up Telegraph Hill more times than I can remember. 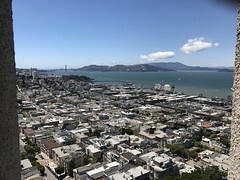 I’ve walked up and down the staircases of both the Greenwich Steps and the Filbert Steps, as well as semi-staircase sidewalk along Filbert Street from Washington Square on the western side of the hill. But Coit Tower itself? Sure I’ve gone in and looked at the murals, but as for the trip up to the top I was always turned off by the price and the long lines. Well, it turns out you can take the elevator ride to the top either for free, or without waiting in line — but not both. How? Let me explain. In my case the employees seemed a little confused by the skip the line ticket, but accommodated me nonetheless. If there’s a line at the front door, just present the printed pass and they’ll wave you through to the gift shop. From there, the cashier took my pass, gave me a hand stamp and a receipt, then told me to go back to the elevator and wait for the next group. 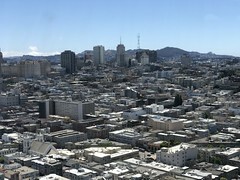 Once the elevator operator has taken you to 15 or so stories up you’re actually not at the top — you’re at a lower observation platform for people with disabilities. Assuming you’re able there’s still two flights of stairs to climb. 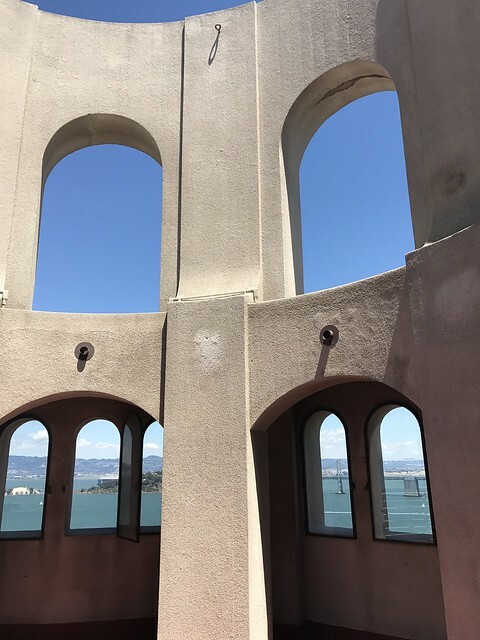 The top of the tower looks pretty much like what you’d expect from the ground — it’s an open air viewing area with sets of three windows on each side. That said, to my surprise, many of the windows were open. Visitors were sticking their cameras out of them to take photos. I wonder how many people have accidentally dropped their cameras? 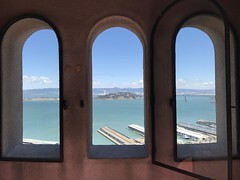 From these windows, weather permitting there’s an amazing view of North Beach, the bay, and downtown. Click the photos in the gallery below for a full view. Despite being an iconic tourist attraction, I was surprised by how non-touristy it felt at the top. The atmosphere was relaxed, the elevator operator was very chill, and the only crowd was the line in the lobby. 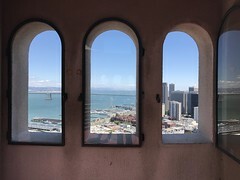 I should point out there is a second activity at Coit Tower that isn’t as well advertised, and I have yet to try it myself: in addition to the Depression era murals in the lobby, there’s a small second floor above it with more murals. This second floor was closed to the public up until 2014 and still isn’t as open as the lobby. You can book paid mural tours either in the ticket window at the lobby, or through the skip the line website (see above.) Or if you’d rather not pay anything, SF City Guides has a free tour of the murals on a regular basis. Both include access to the second floor area. 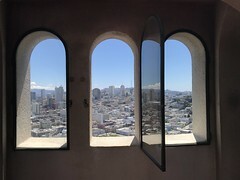 If you are up there at the right time, you can see staff coming out a door, beneath Ben Cunningham’s “Outdoor Life.” This is something else as unknown as the second-floor murals: the long-rumored Coit Tower caretaker’s apartment, now converted to an office. What were they thinking?! With a location like that, even a cramped apartment could have easily fetched a steep rent — especially if it included unlimited roof access. I’d certainly consider moving in. Trinity Place, the aggressively rectangular apartment buildings in mid market are still under construction. 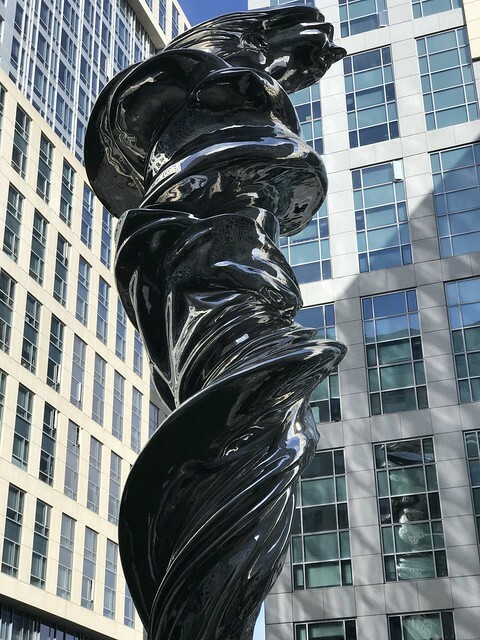 But the main plaza and much reported on Venus sculpture by artist Lawrence Argent have already been installed and are ready for their close ups. So, how can you go see it? But if you walk around to the 8th Street side of Trinity Place between Mission and Market, there’s an alley without a gate. And that’s where things get interesting. 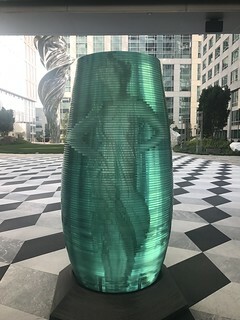 Walking down the alley, I noticed something unexpected: a sculpture seemingly trapped in a blue/green ringed glass container. This was at one end of a small hallway leading to the plaza where the Venus sculpture rests. At the other end of the hallway, what do you know — a second trapped sculpture. 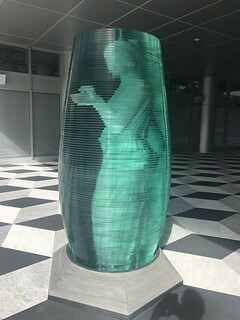 Both seemed reminiscent of the main attraction in that they all exhibit eerily modern looking distortion applied to what otherwise seem to be classic Greek or Roman-like works. 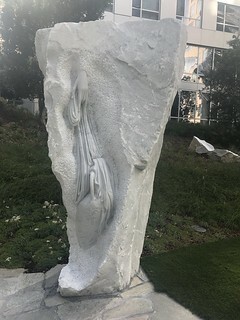 It turns out that the Venus sculpture is the largest part of a a series of art installations called C’era Una Volta, which includes the aforementioned sculptures, the plaza itself, and a number of intricate rock carvings. Without C’era Una Volta, Trinity Place would look like a bland, generic apartment complex; with it, I could almost forget the buildings even existed. 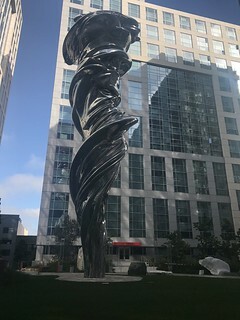 The modern, whimsical sculpture garden was easily captivating enough to distract me from the otherwise uninspired surrounding architecture. You are currently browsing the MrEricSir.com blog archives for June, 2017.